It's that time of year again when the SCEC office is a hub of excitement and festive energy with World Environment Day Festival just around the corner. If you haven't been in a few years, come check out the vibes down by the water, it's not to be missed. On other news, keep scrolling as we've got lots for you this month! We're just two weeks away! In a Special Planning Meeting on 13 April (yes, that was Easter Long Weekend Eve!) 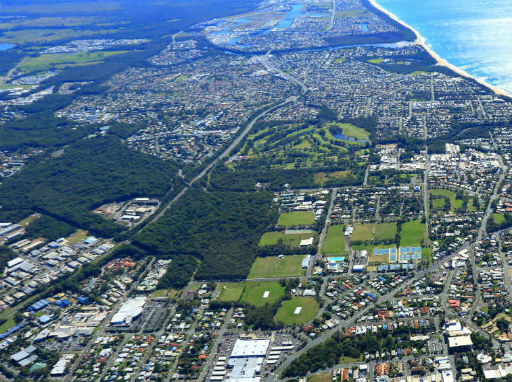 held mostly in confidential session and into the evening, Council contentiously progressed a draft major planning scheme amendment for a 104ha parcel on the Maroochy River floodplain known as Twin Waters West. This draft amendment sought to change its current (and appropriate) rural zoning to emerging community zone ie. residential development for around 2000 people. Despite 80% of the 629 properly made submissions objecting to the amendment, the majority of Councillors chose to support the Officer's recommendation to progress the amendment. This ignored a raft of fundamental issues such as flooding vulnerability, the current & relatively new planning scheme not contemplating urban development on this site due to its significant contraints, its environmental & habitat values. Adding to the poor process and planning 'policy' is this costly amendment with its wide ranging consequences was brought on by the landowner Stockland and a very small number of residents grossly overstating the so-called 'support' for the development. The draft amendment will now be sent to the Planning Minister Jackie Trad MP for consideration. This amendment should never have got this far and needs to be stopped in its flood prone tracks. While Council has plenty to answer for, any social licence Stockland may claim to have to operate in the region has been severely eroded. undertake a further analysis of the economic, tourism, social and environmental impacts of the available options -including the retention of geofabric bags at the Maroochy River entrance groyne and to undertake wide community engagement on the available options to inform any future recommendations. 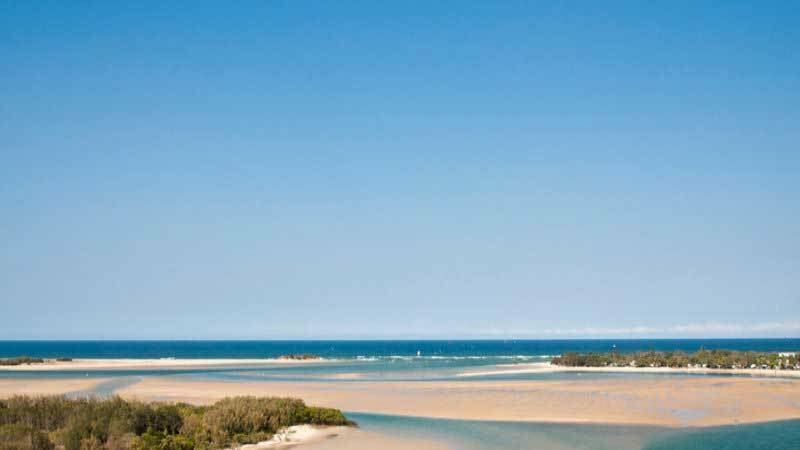 To progress the consultation, Council has called for Expressions of Interest (EOI) for representatives on the Maroochy River Estuary Consultation Group (MRECG) and outlined a series of public meetings and consultation opportunities. SCEC has submitted an EOI and looks forward to the opportunity to participating to ensure the best outcome for the magnificient Maroochy. 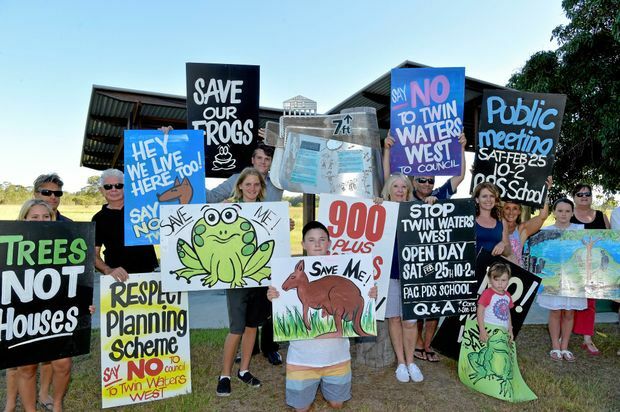 Check out the Don't Rock the Maroochy website and petition. 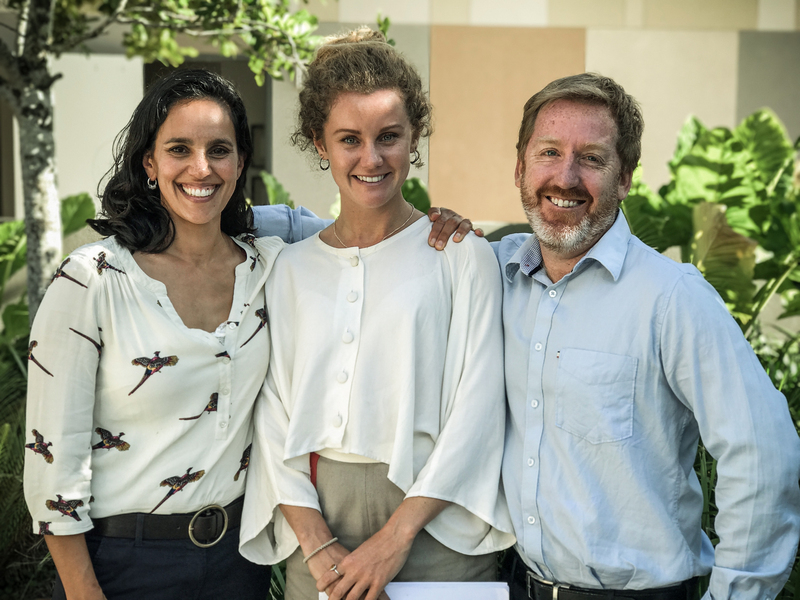 In the first week of May, SCEC Coordinator Leah Hays (centred) alongside SCEC's trusty volunteer Chad Buxton (right), joined Tooni from the Australian Marine Conservation Society (left) at the Senate Inquiry into Shark Mitigation and Deterrent Measures in Byron Bay. SCEC were invited to attend alongside a selection of others to provide evidence to back up our stance which we had outlined in our Submission. Surprisingly, SCEC were the only ones present representing QLD. SCEC's stance: to have outdated and ineffective shark nets removed in QLD and replaced with non-lethal technology that aims to keep both humans and marine life safe. Both Leah and Chad walked away from the hearing feeling highly impressed by Senator Whish-Wilson and the standard in which the hearing was conducted. They felt listed to, respected and a genuine interest and concern from the committee, even as the last speakers of the day. You can access SCEC's submission (we're #35) here or view the transcript from the hearing here. Since the hearing, the Senators Office have contacted SCEC advising that another hearing is planned for Brisbane, with the aim of engaging the staunchly 'stuck in their way' QLD government. If you're hot on the topic and represent the Gold Coast, Sunshine Coast or beyond, perhaps consider attending the next hearing or contact SCEC coordinator Leah Hays to express your interest in attending the public hearing. What isn't clear and what Sekisui is deliberately playing down is what they are proposing is essentially an intensive residential estate consisting of over 1000 dwellings for more than 2000 people! The hotel is only a small component which would ultimately be dominated and potentially compromised by a high-density urban development not in keeping with the irreplaceable natural amenity of this iconic locality. SCEC considers this 19ha beachside site to be so significant that it should be solely dedicated to a world-class low-rise ecotourism resort, not squandered on such an inappororiate proposal-yet again! Evan Aldridge himself, Sekisui House Development Manager, has expressed the importance of this site for tourism. It should therefore be its primary and exclusive use, not just a hotel tacked onto an intensive residential estate. It must be noted that SCEC’s attendance at the discussion group sessions was to ensure transparency and observance of the planning scheme and in no way endorsed any concept or proposal. This is still the case! Council issued an Acknowledgment Notice on 19 May. Sekisui will send its application to referral agencies. Council will ask for more information. 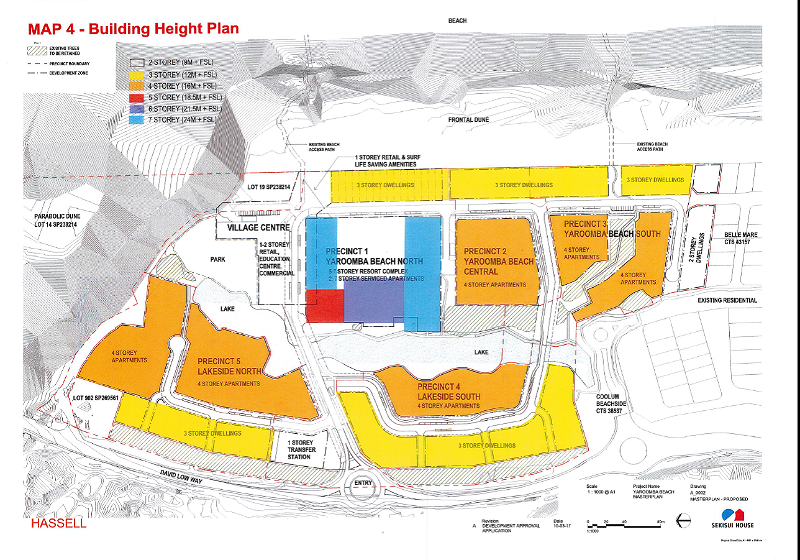 Developers rarely provide enough information for Council to properly assess an application. Public notification will take place and submissions will be accepted. Council will decide the application. SCEC is looking closely at the application documents and will be making further comment. So stay tuned and check out the application embellished by a slick marketing campaign with all its spin, not genuine community consultation and respect for the planning scheme. This Letter to the Editor sums it up...! Sunshine Coast Council has unveiled its proposed long-term strategy to maintain the liveability of the region and build on its already outstanding environmental credentials over the next 25 years. The Draft Environment and Liveability Strategy focuses on how the Sunshine Coast’s natural environment can be preserved and enhanced while enabling a good quality of life for all residents in an accessible and well-connected built environment. See the documents and provide your feedback by 4th June here. SCEC's Earth Hour event was a huge success! 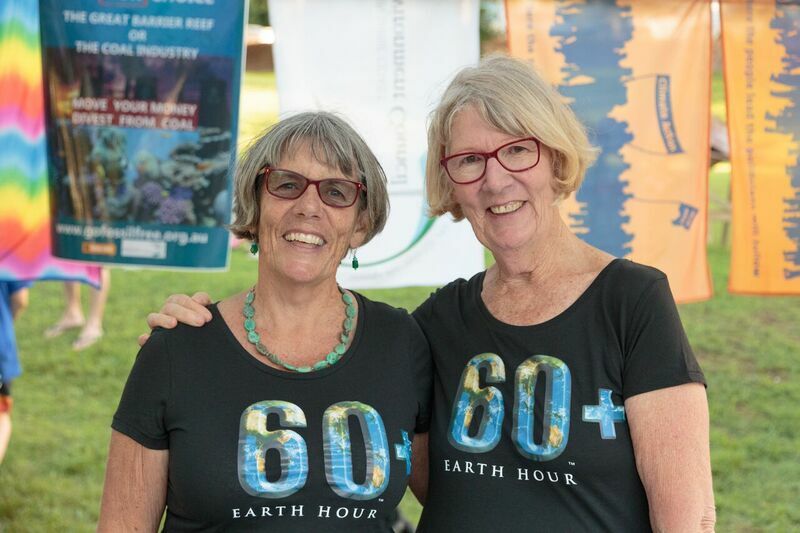 Eumundi proved to be the pefect location to host the 10 year anniversary of Earth Hour. 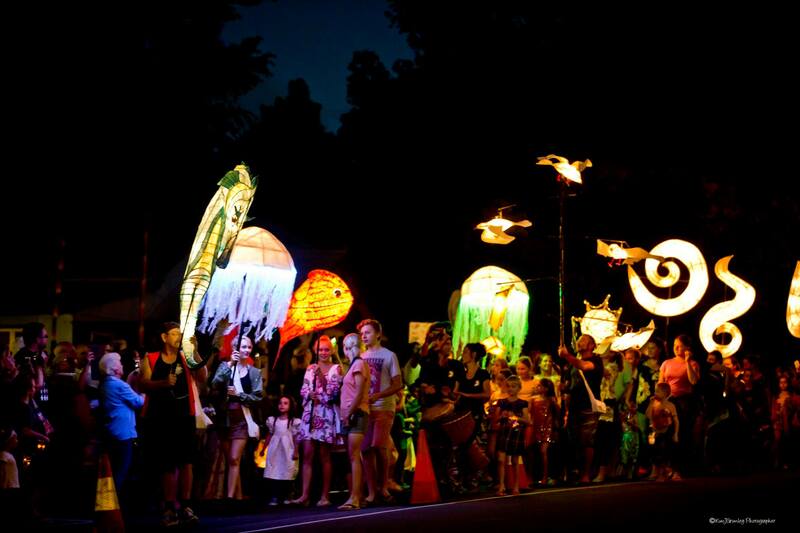 SCEC alongside Starry Nights Cinema, Eumundi Combined Community Organisation and the Sunshine Coast Council put on a fabulous day (and night) of interactive craft activities, marimbas, drumming, street food, a stunning lantern parade and an outdoor cinema. Check out the little clip above that was kindly donated to us by The Film Tree. We'd like to thank the people of Eumundi, our event partners and all who attended for such a memorable event! SCEC Vice President Mary-Jane Weld with SCEC President Vivien Griffin. SCEC joined with our regional and national conservation collegues at the Minister's Environment Roundtable recently. Organised by the Queensland Conservation Council and the Department for Environment and Heritage Protection (DEHP), this is an important and welcome opportunity to brief the Minister for Environment and Heritage Protection and Minister for National Parks and the Great Barrier Reef, the Hon Dr Steven Miles, and senior departmental staff on environmental issues affecting Queensland. These forums demonstrate the strong representation and cohesive nature of the conservation sector who work and volunteer passionately on behalf of nature, the environment and communities. Locals and visitors who enjoy exploring the natural setting of Caloundra Town Reserve are encouraged to have their say on a draft concept plan for the area to guide future uses and activities on the site. The reserve consists of around 49ha of bushland and caters for a range of recreational activities for the community. Submissions on the concept can be made online via council’s website, or by contacting council for a hard copy of the survey. Submissions close 5pm on Friday, June 9, 2017. 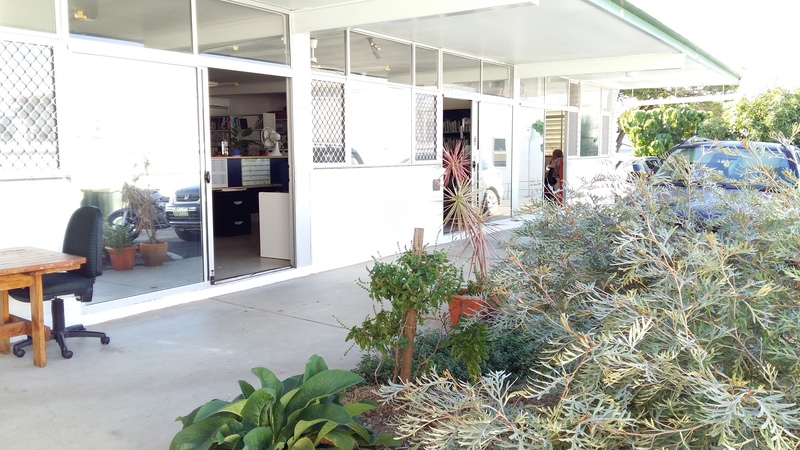 Our lovely landlord was good enough to arrange for the well weathered exterior of the SCEC headquaters to be splashed in a fresh coat of paint. Combined with a new flourishing garden we feel it has created a pleasent space for our staff and volunteers to relax and enjoy lunch. We'd also like to take the oppurtunity to welcome our new volunteers, James, Chad and Jane who have been a huge help amidst busy SCEC happenings - we really couldn't do it without them! World Environment Day Festival! - Bands announced! On Sunday the 4th June we'll be bringing you the 38th annual World Environment Day Festival. Last year we took WED Festival back to its grassroots at Cotton Tree, and this year we'll be doing the same. 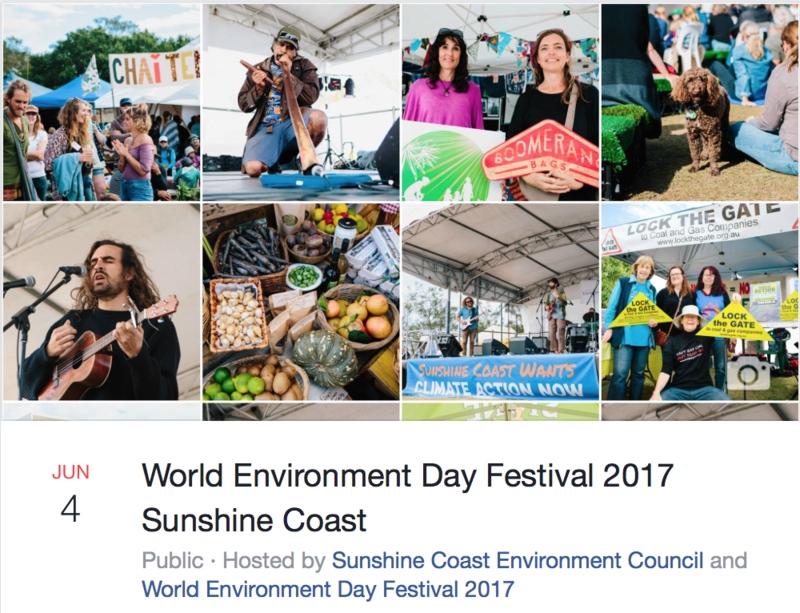 Come enjoy the afternoon tunes, cold brews and stories from over 40 environmental groups who will be showcasing their hardwork and dedication to conserving the natural values of the Sunshine Coast and beyond. Make sure to jump onto our Facebook event page and invite your friends and family along! It's bound to be a fun day for all! 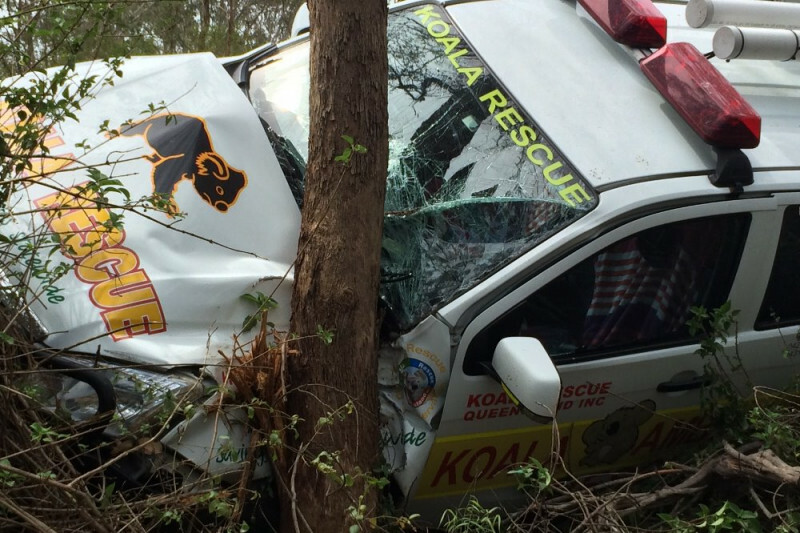 Queensland Koala Rescue are urgently seeking your support to help raise funds to replace their Koala Rescue vehicle. Please consider donating to their crowd funding campaign below. Please nominate those in the community looking to protect our land and waterways. Lets reward, recognise and celebrate them. Healthy Land and Water is an independent, not-for-profit organisation working to improve the sustainable use of land and waterways in South-East Queensland. The nominations are open so please step up for those doing outstanding work in the field. Global Divestment Mobilsation (GDM) is encouraging divestment as an effective tool to stigmatise the fossil fuel industry. 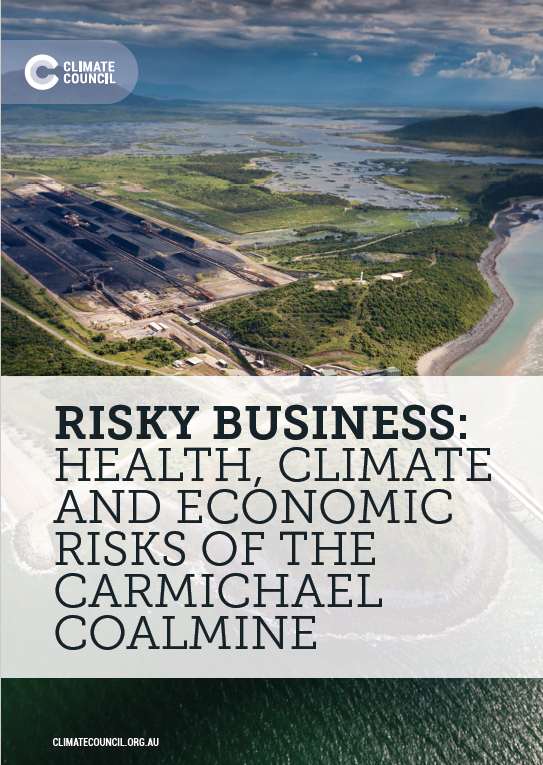 GDM's goal is to solidify the association between climate impacts and the moral urgency to divest from fossil fuels; and to build momentum for divestment in new regions. We missed the start day but we still think you should get involved. See how you can work towards a personal difference. Abrupt glacier melt has caused a once powerful river to dry up in Canada's remote north-west, an irreversable change on the areas eco-system. Is gas a solution to the energy crisis? Is gas expansion the key to Australia’s energy future? 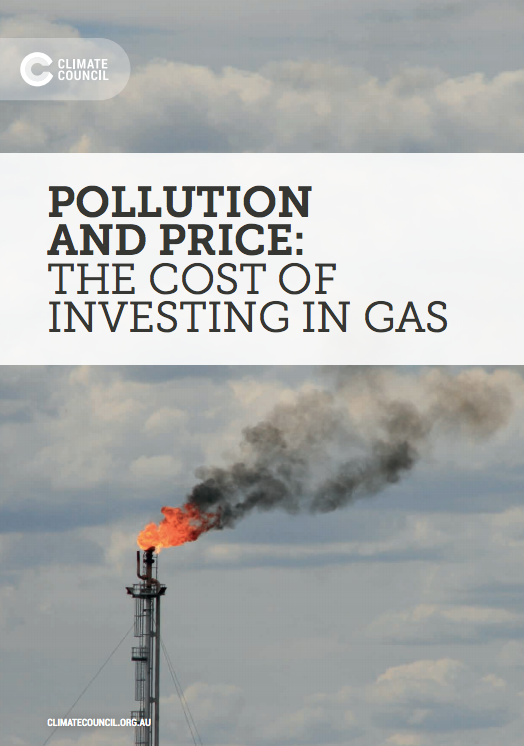 The Climate Council's report found that investing in new gas will drive higher electricity prices and lock in pollution for decades to come. To tackle climate change and protect Australians from worsening extreme weather we need our electricity system to produce zero emissions before 2050. The South East Queensland’s Water Security Program 2016-2046 has been released. 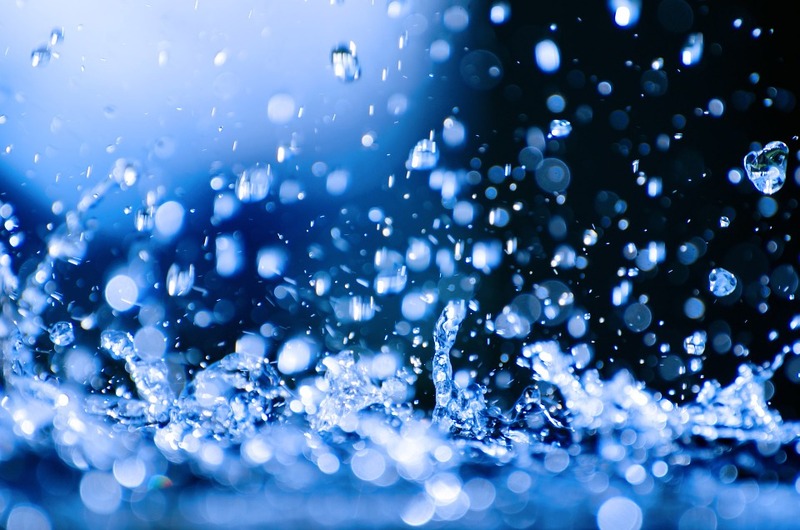 The plan outlines how Seqwater intends to provide safe, secure and cost-effective drinking water over the next 30 years. 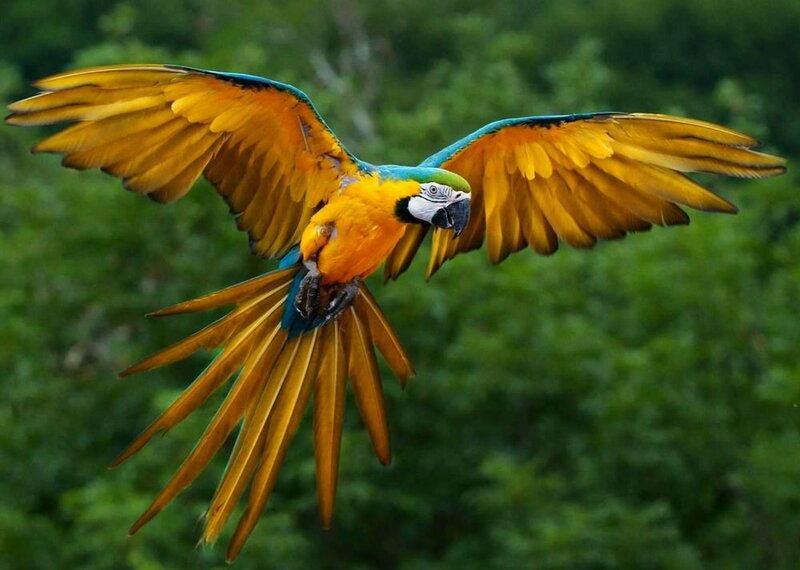 Moves are being taken to revoke and downgrade the protected areas in southern Amazonas by 1.5 million hectares. 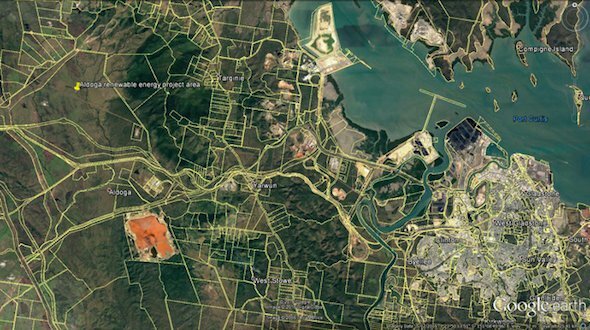 The Queensland government has earmarked one of the state’s major coal centres as a future renewable energy hub, calling for expressions of interest to develop up to 450MW of large-scale solar, wind or biofuels on a 1,248 hectare patch near Gladstone. Economic Development Queensland (EDQ) said it was seeking to enter into an agreement with an organisation or consortia that “will act quickly” to develop a large scale solar farm or other renewable energy facility on government-owned land at Aldoga, within the Gladstone State Development area. The Aldoga site will be EDQ’s flagship renewable energy project and is part of the government’s Advancing Our Cities and Regions Strategy, which aims to renew and repurpose underutilised state land to generate jobs and drive economic growth. 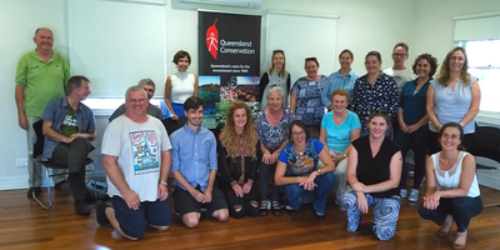 Every Friday – Free Friday Environment Forums hosted by Noosa Parks Association every Friday at 10am. To see the schedule of upcoming talks, follow this link. May 22 - Bli Bli Wetlands (8am). Meeting Point: Follow the signs to the wetlands with parking at the end of Sports Road, Bli Bli. 23 May - World Turtle Day – Help celebrate and get behind the 17th Annual World Turtle Day. If you want to promote the day on social media, you can get images and info here. 28 May – Sea Shepherd Marine Debris Campaign – Beach Clean, 9am – 11am at Alex Heads Beach. Love the beach? Then come and help us keep it beautiful and clean, and protect the wildlife that live in the waters off of our coastline! For more information click here. 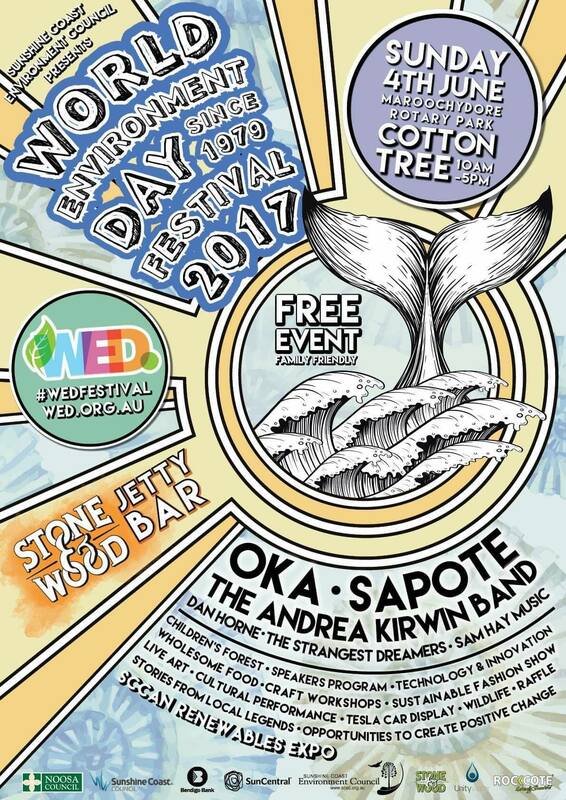 4 June - World Environment Day Festival - 10am-5pm at Maroochydore Rotary Park, Cotton Tree. Come join SCEC and over 40 of our member groups to celebrate our unique environment. Live music, children's forest, wildlife, craft, live art, renewables, electric cars, speakers program, fundraiser jetty bar - the list goes on. RSVP here. 9 Wallace Park, Noosaville. What happens to our injured critters? Wildlife Rehabilitation Centre and RSPCA Qld will be talking about the process of care and release of our injured wildlife. SCEC AGM - Thursday 29th June - To be held at 4.30pm at 3 Porters Lane Nambour. Winners of the World Environment Day Festival Raffle will be drawn and announced. Australian Marine Debris Database - Are you or your group cleaning up our beaches? If so, why not contribute to a national database that will be used by scientists and government bodies? Join the Tangaroa Blue initiative and submit some data. Find out how here. Need some Volunteers? – Finding volunteers is sometimes hard. Volunteers R Us is a non-profit platform, built by non-profits for non-profit organisations. This platform’s intent is to help your group source volunteers for your office or projects. Register here. Have a happy and safe coming month and we look forward to seeing you at the Festival!